This weekend I got to put the cherry on top of a very sweet stitchy experience. I finished a project that I started last summer in the form of hand sewn, English paper pieced flowers for the Kingfisher quilt. You see, there were five or so hexie flowers that I didn’t use for my quilt, because I switched to a more limited color scheme. The castoff flowers looked lovely, but forlorn sitting around with no future in mind. 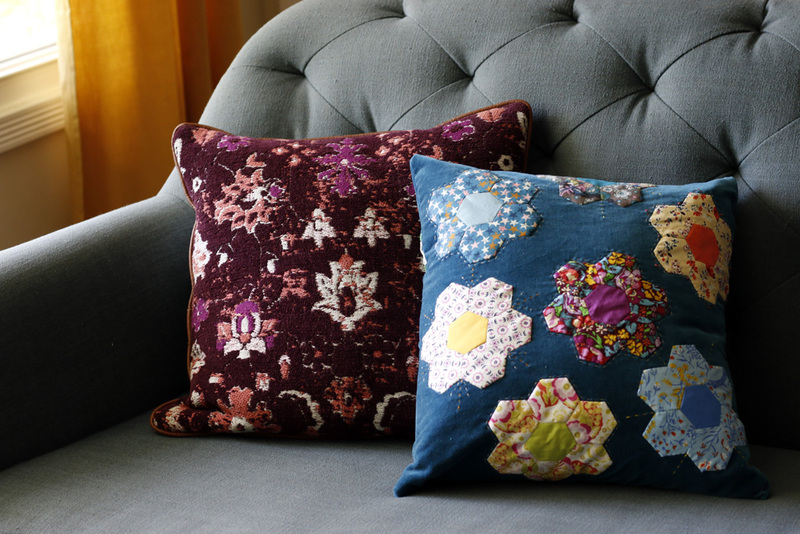 I rescued them by appliquéing them by hand, scattered on a large scrap piece of sapphire velveteen. A pillow! I love the way that the flowers wrap around the edges in places. It makes such a pretty presentation from every angle. This pillow is finished with envelope closure, which allowed for strategic placement of ribbon trim to dress up the “wrong” side of the pillow. All of these ribbons are things I had on hand - just like the flowers and velveteen and pillow form too. Maybe it’s the most lux “scrap” project I’ve ever made? I could be convinced. There’s nothing like moving house to motivate wrapping up stitchy loose ends. As much as I enjoyed the slow-stitching process, I’m happy to celebrate this finish today. However, I don't need to bring another throw pillow overseas. We’re going to have one sofa instead of three, so I’m definitely not authorized to add to the collection! Velveteen Stitches pillow has been listed in my Handmades shop. I hope someone enjoys!